This is my favorite map. 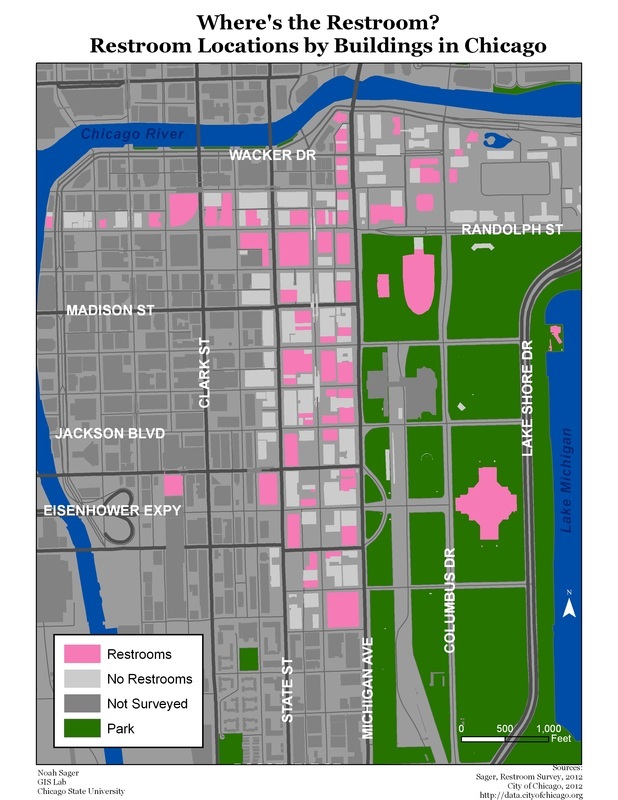 All 299 restroom points were spatially joined to buildings (via the building footprint shapefile from the City of Chicago). Here you can see all the buildings which have public restrooms, and those that do not (darker grey buildings were not surveyed). It's amazing how many places you can't go, but you wouldn't know otherwise (unless you had a map). Clicking on the map will enlarge the image. 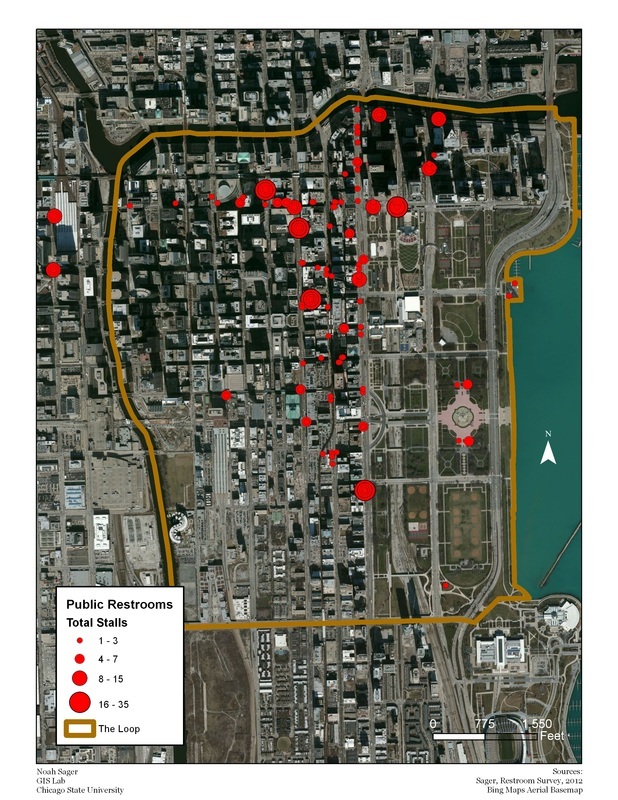 This map shows the results of mapping and surveying 299 restrooms in the Loop of Chicago. 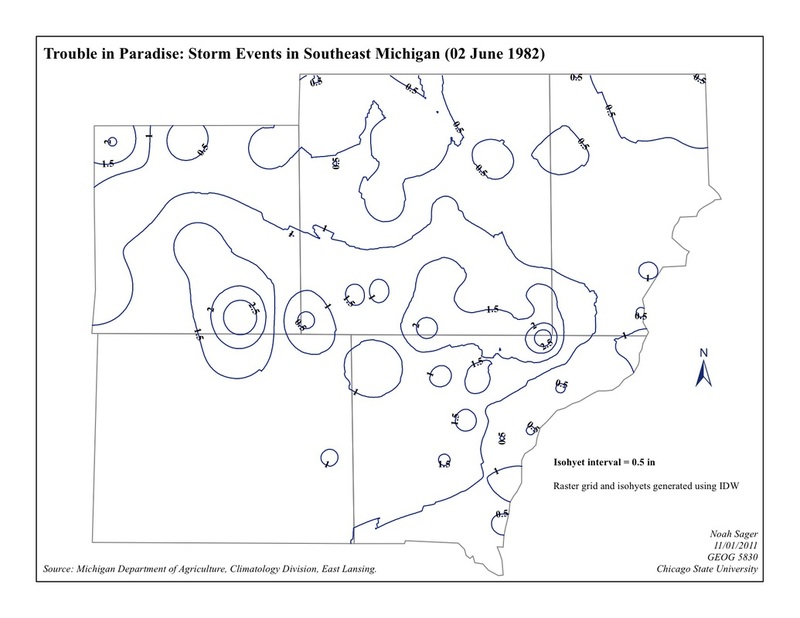 As you can see, I did not finish the Loop area, but after 18 months of working on this project, I have enough data to make some useful maps for people. Clicking on the map will enlarge the image. Here's a fun map, using the same methods as the previous map, but using the building footprints as the bounded geographic space I was able to make a choropleth map for total restroom asset densities using toilet stalls (1 pt) and urinals (0.67 pt) as the values. 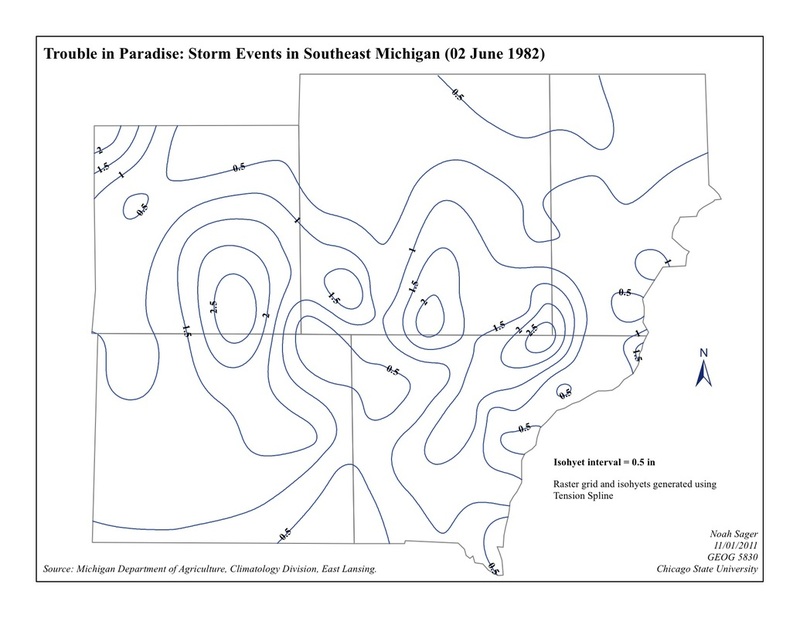 You can see a fairly random distribution of asset densities in this map. Clicking on the map will enlarge the image. Using the same methods as the previous map, but using the building footprints as the bounded geographic space I was able to make a choropleth map for baby changing station densities. 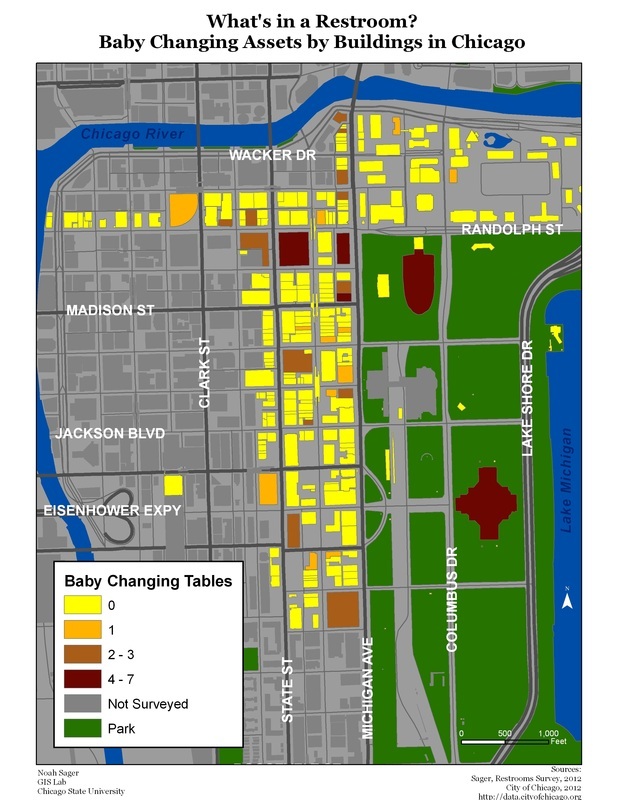 You can see a fairly random distribution of asset densities in this map, but notice all the yellow buildings indicating no baby changing. There's a lot. Clicking on the map will enlarge the image. 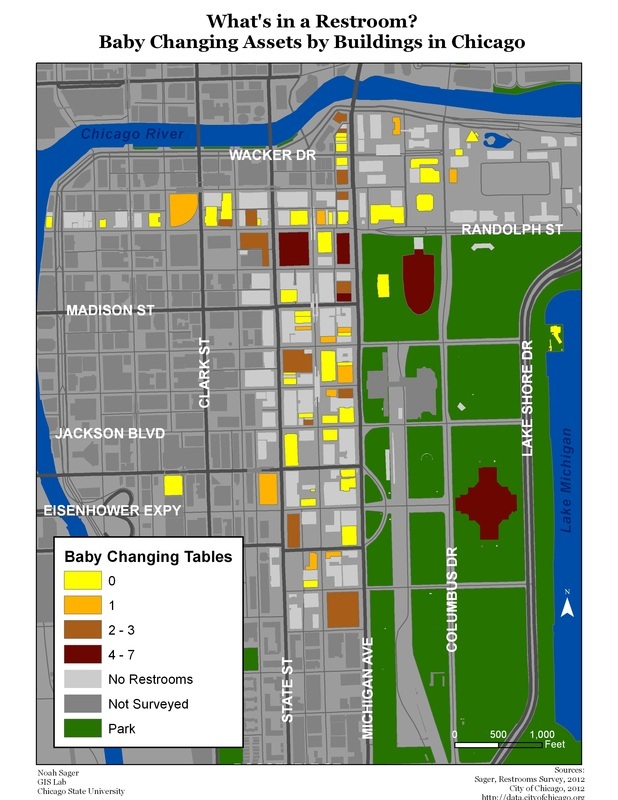 Here's a nice piece of propaganda, using the same methods as the previous map, but now the buildings that have no restrooms are colored the same yellow as buildings that have restrooms but did not have baby changing stations. You can see a sea of yellow with a few islands of amenities in the city. Now if you were moving through public spaces with a small child, would you know where to go? If it's cold and windy outside, would you know how far or in what direction to travel to fullfil a basic human need for your baby? Clicking on the map will enlarge the image. Using the same methods as the previous map, but using the building footprints as the bounded geographic space I was able to make a choropleth map for tampon machine densities. 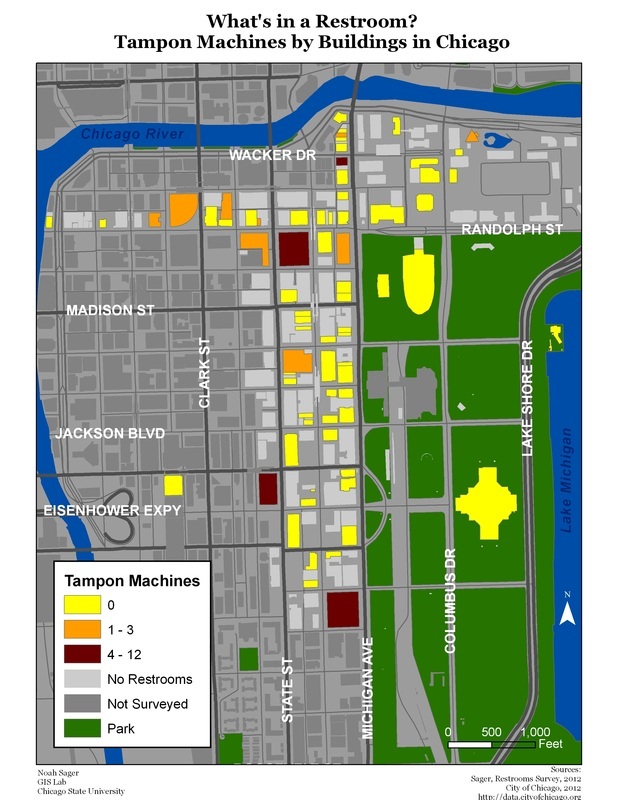 You can see a fairly random distribution of asset densities in this map, but notice all the yellow buildings indicating no tampons. There's a lot. Clicking on the map will enlarge the image. 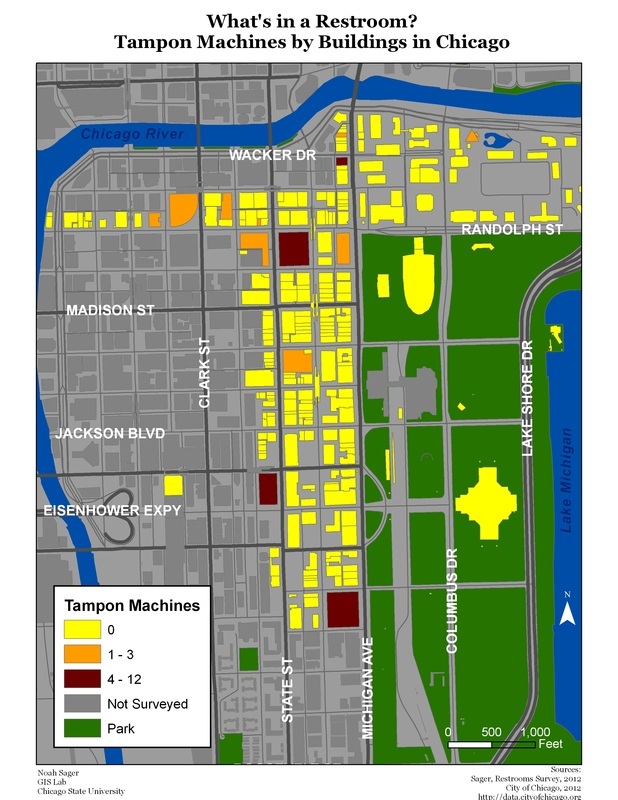 Here's a nice piece of propaganda, using the same methods as the previous map, but now the buildings that have no restrooms are colored the same yellow as buildings that have restrooms but did not have tampon machines. You can see a sea of yellow with a few islands of amenities in the city. Now if you were moving through public spaces, would you know where to go? If it's hot and humid outside, would you know how far or in what direction to travel to fullfil a basic human need? If men required tampons instead of women, do you think this map would look the same? Clicking on the map will enlarge the image. 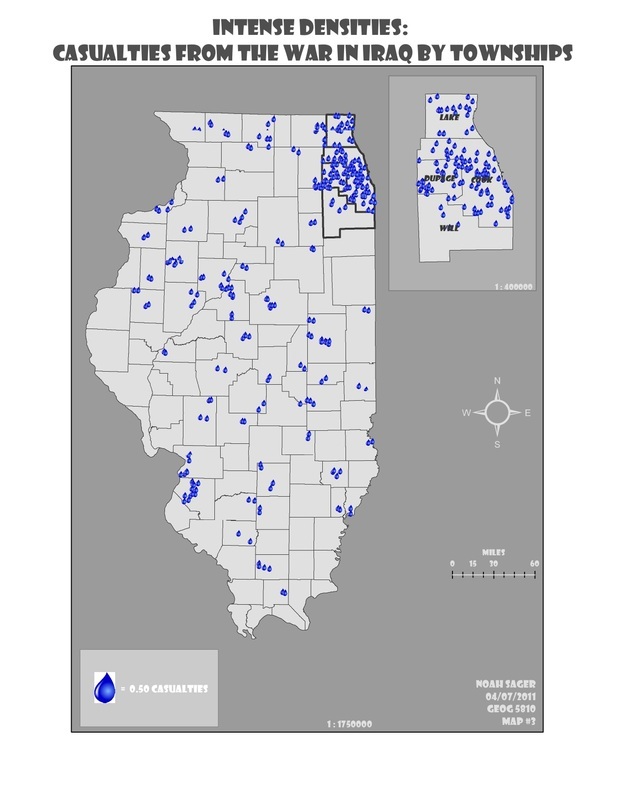 Using the same methods as the previous map, but using the building footprints as the bounded geographic space I was able to make a choropleth map for junior urinals (also used as handicapped accessible urinals). You can see a fairly random distribution of asset densities in this map, but notice all the yellow buildings indicating no junior urinals. There's a lot. Clicking on the map will enlarge the image. Again with the propaganda. Using the same methods as the previous map, but now the buildings that have no restrooms are colored the same yellow as buildings that have restrooms but did not have junior urinals. You can see a sea of yellow with a few islands of amenities in the city. Clicking on the map will enlarge the image. Last two maps for restrooms. Using the same methods as the previous map, by using the building footprints as the bounded geographic space I was able to make a choropleth map for handicap accessible stalls. 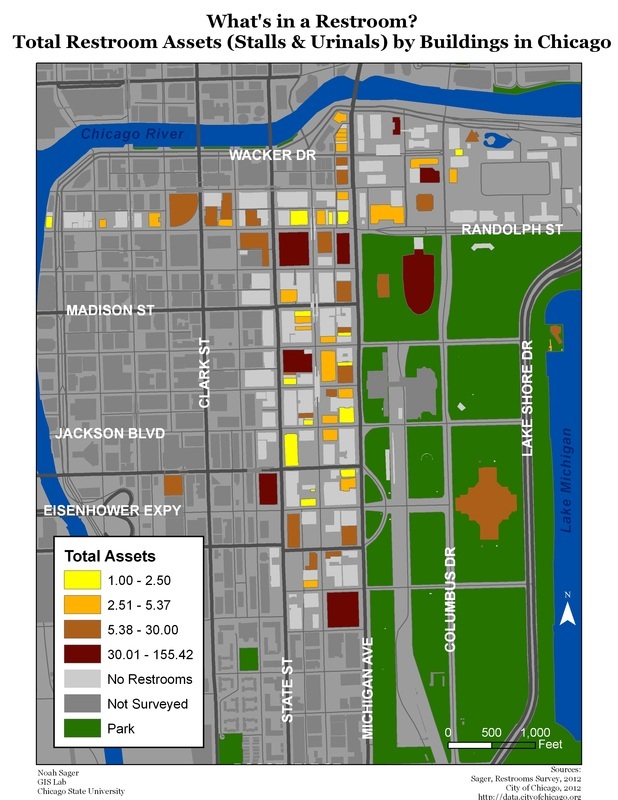 You can see a fairly random distribution of asset densities in this map, but notice the few yellow buildings indicating no handicap access. Even one is too many, and I count three. Clicking on the map will enlarge the image. Look at the propaganda. 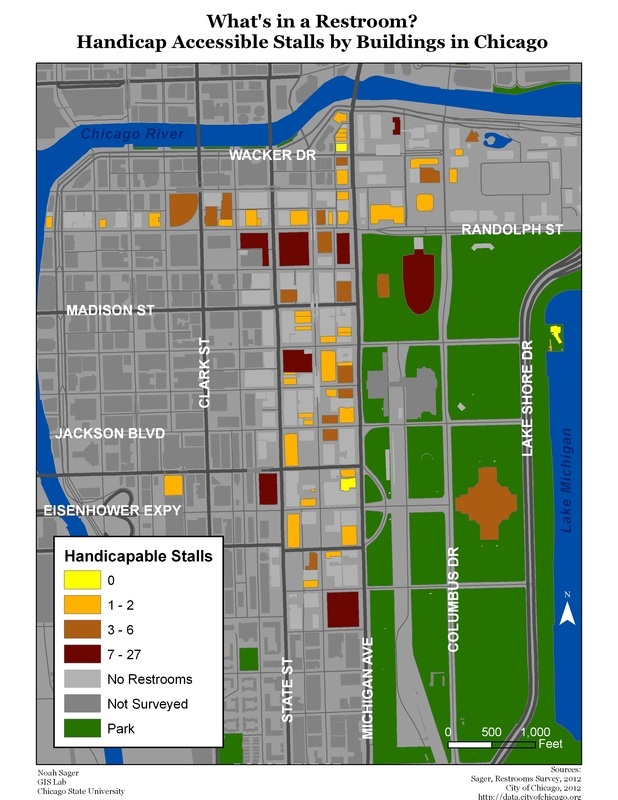 Using the same methods as the previous map, but now the buildings that have no restrooms are colored the same yellow as buildings that have restrooms but did not have handicap accessible stalls. How does this map make you feel? 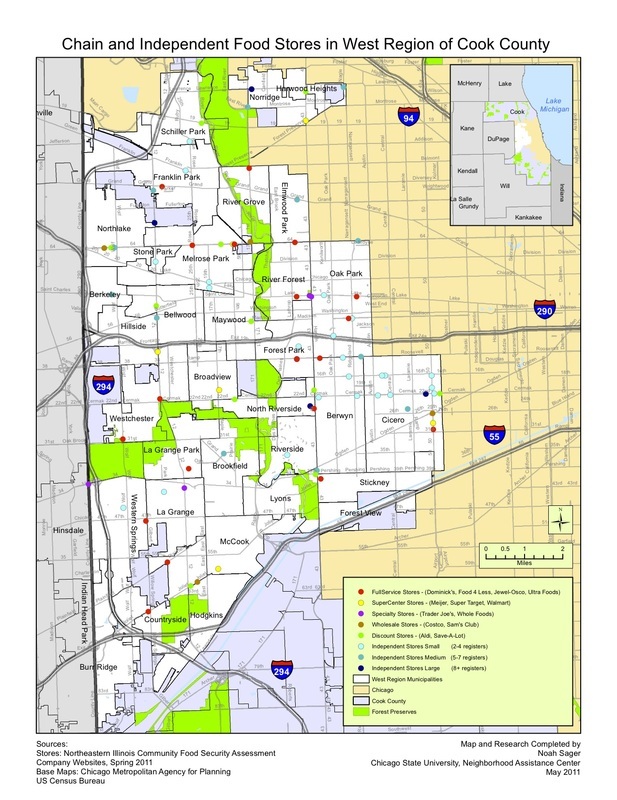 This map shows that if you have a physical disability, it is going to be even more difficult for you to find the amenities you require than if you weren't. This is an important topic, but who's talking about? 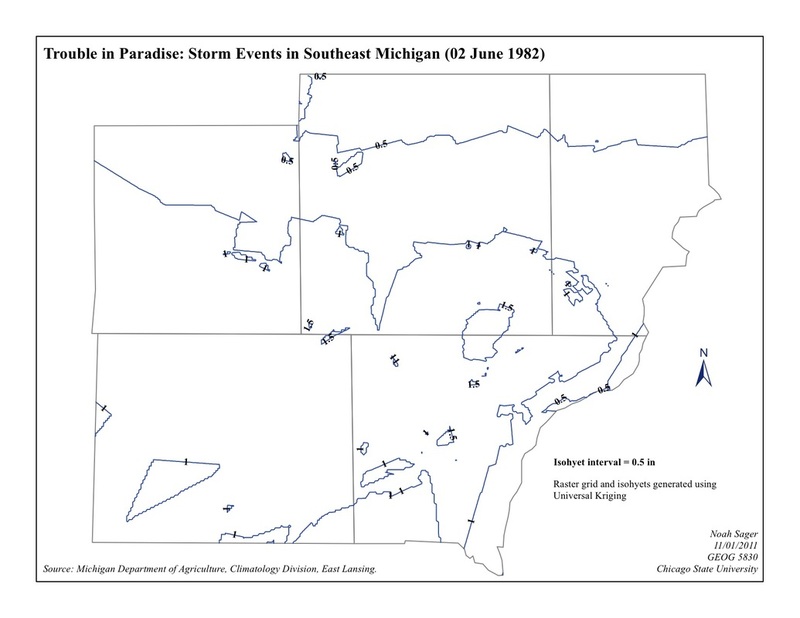 Well, now we have a map, hopefully that will aid in the discussion. Clicking on the map will enlarge the image. 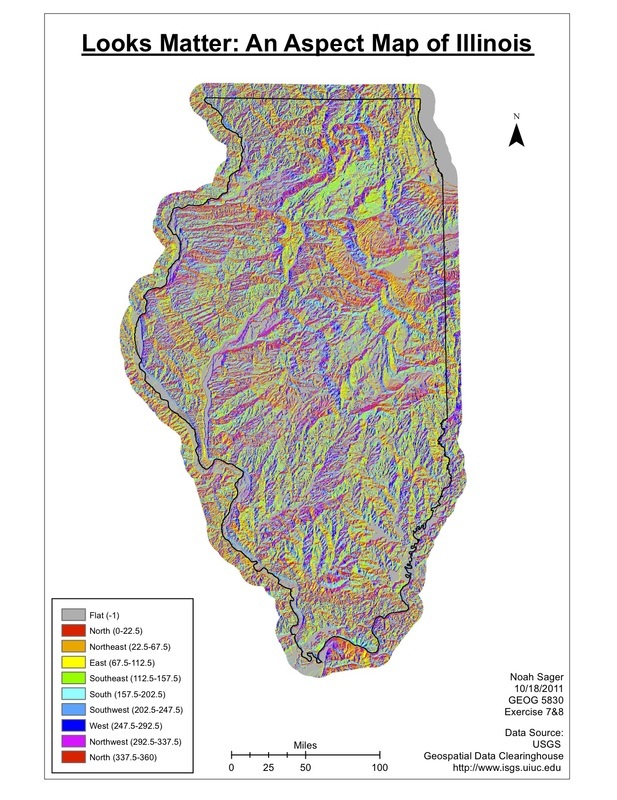 2011 Contour Map of Illinois using DEM raster data. 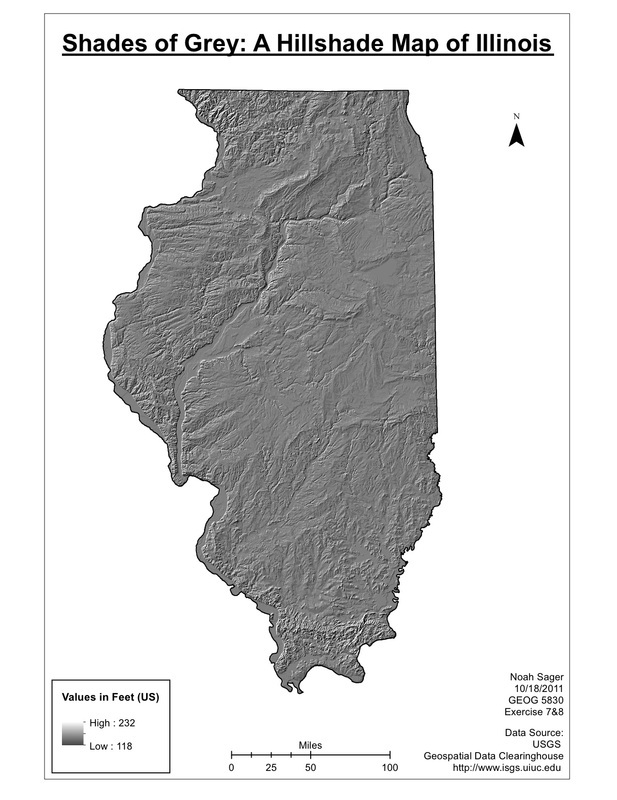 2011 Hillshade Map of Illinois using DEM raster data. 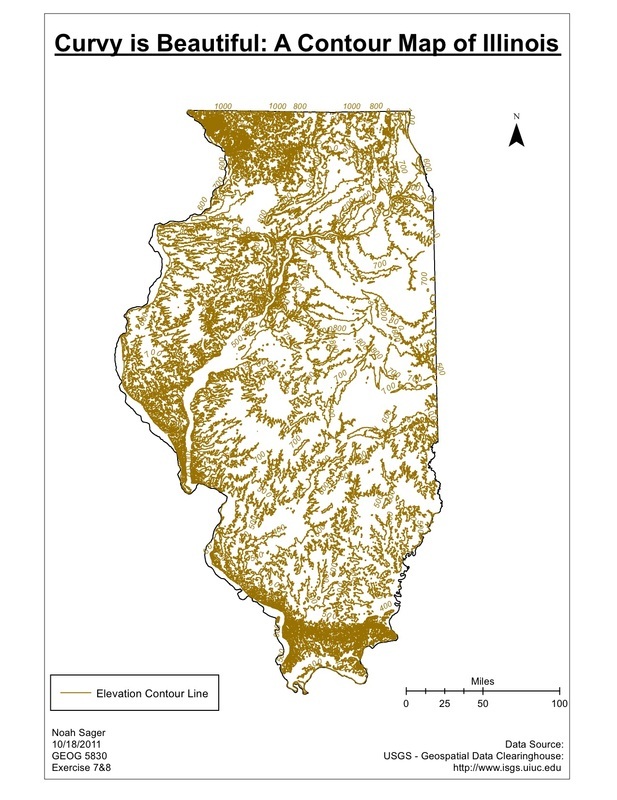 2011 Slope Map of Illinois using DEM raster data. 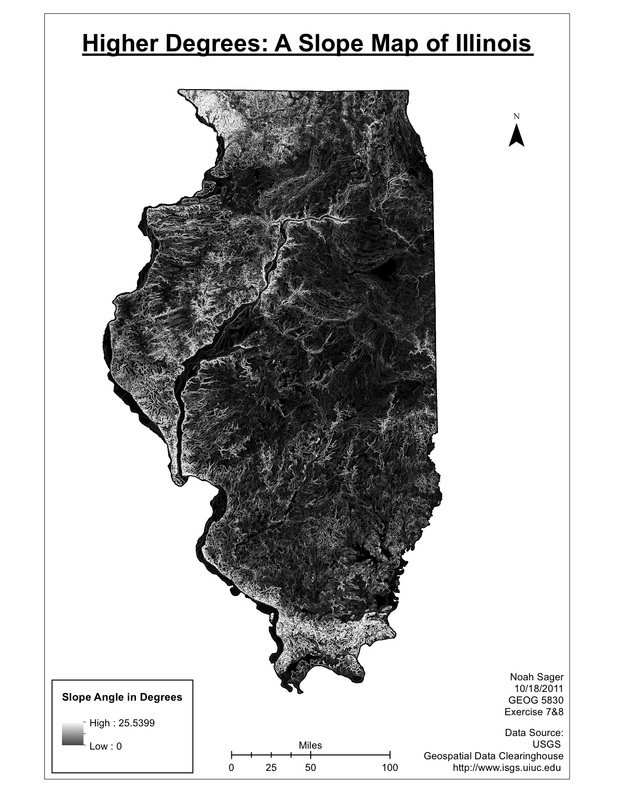 2011 Aspect Map of Illinois (and a bit beyond) using DEM raster data. 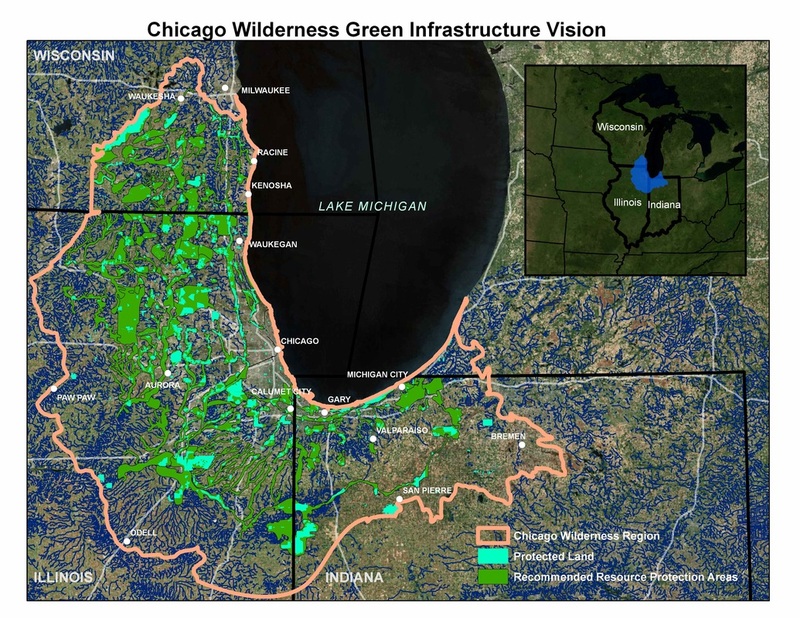 2011 Green Infrastructure Vision map of the Chicago Wilderness created for The Field Museum, ECCo department. Custom built shapefiles overlaid on satellite imagery. 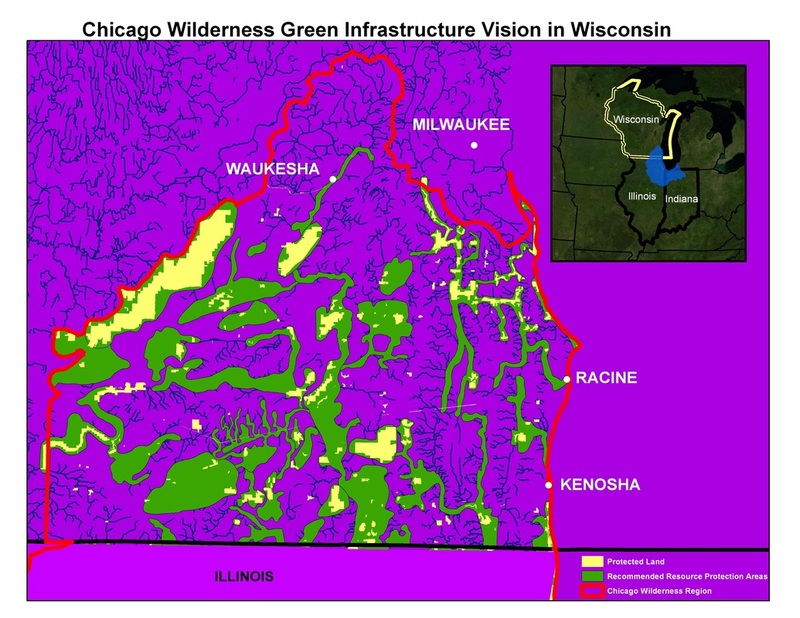 2011 Green Infrastructure Vision map of the Chicago Wilderness in Wisconsin created for The Field Museum, ECCo department. 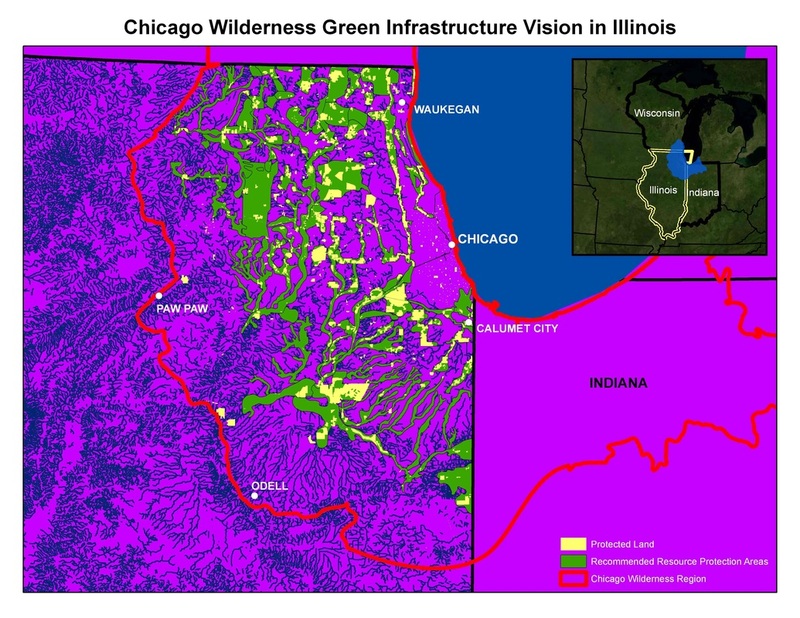 2011 Green Infrastructure Vision map of the Chicago Wilderness in Illinois created for The Field Museum, ECCo department. 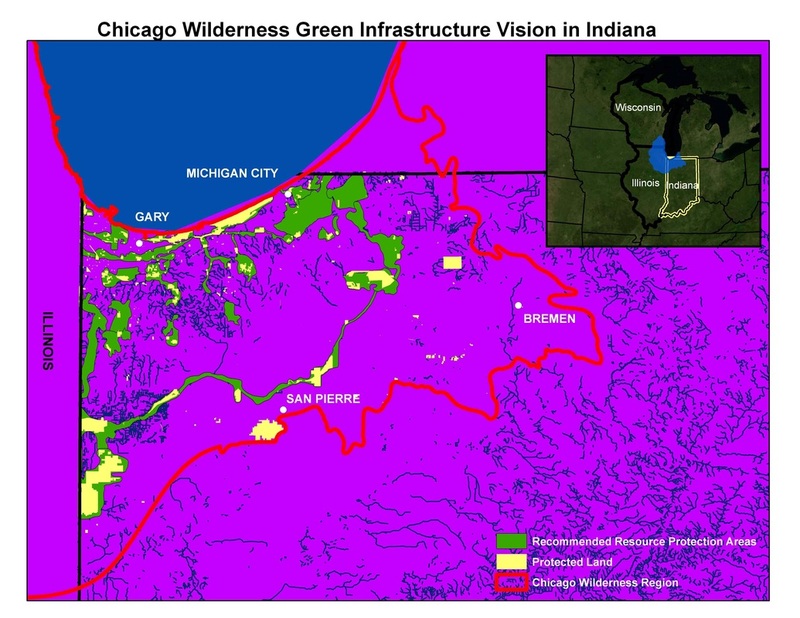 2011 Green Infrastructure Vision map of the Chicago Wilderness in Indiana created for The Field Museum, ECCo department. 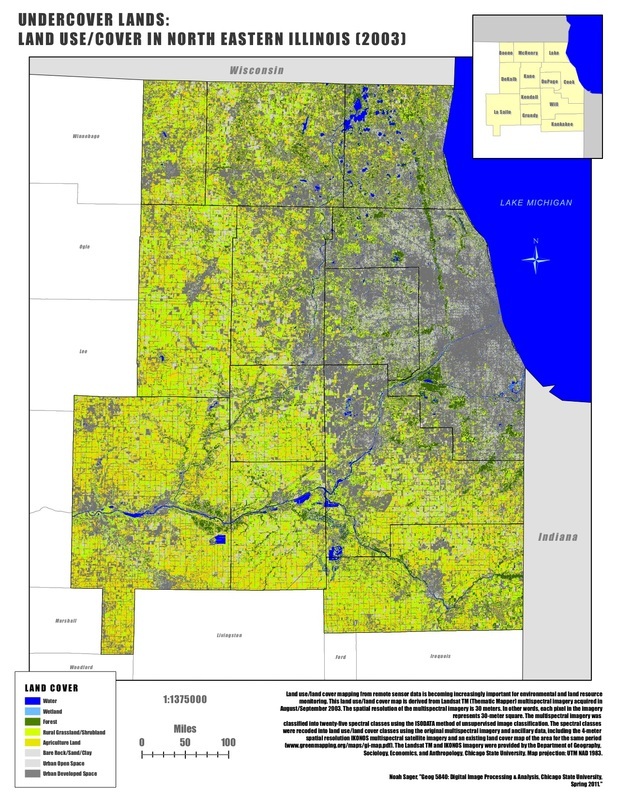 2011 Land use/cover map of several counties in northeast Illinois derived from satellite imagery classified using ERDAS Imagine. 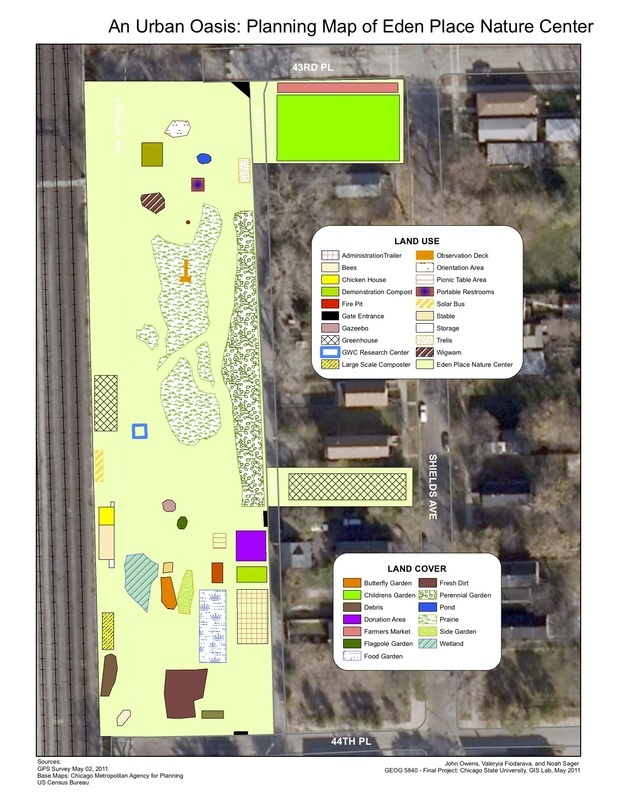 2011 Planning Map for Eden Place Nature Center in Chicago, IL. 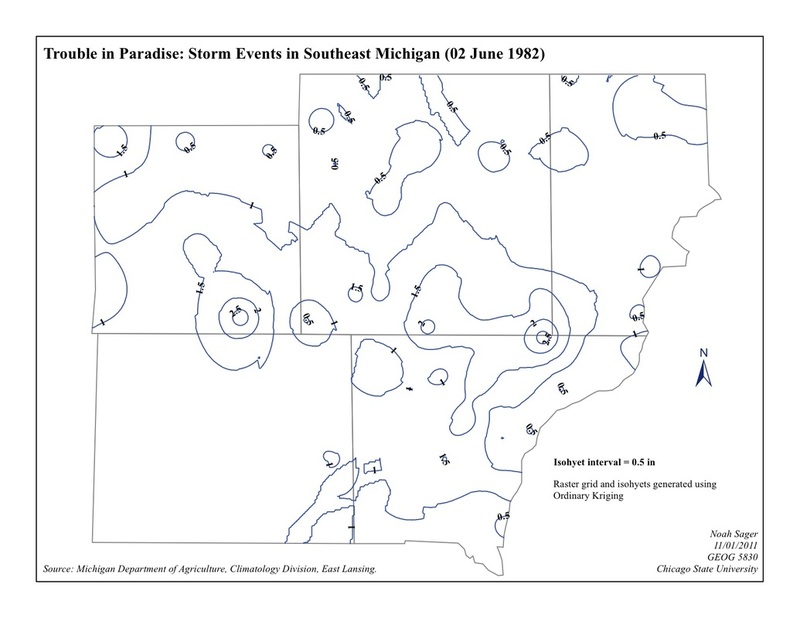 Polygons were custom-built from onsite fieldwork with GPS transponders. Overlaid over aerial imagery. 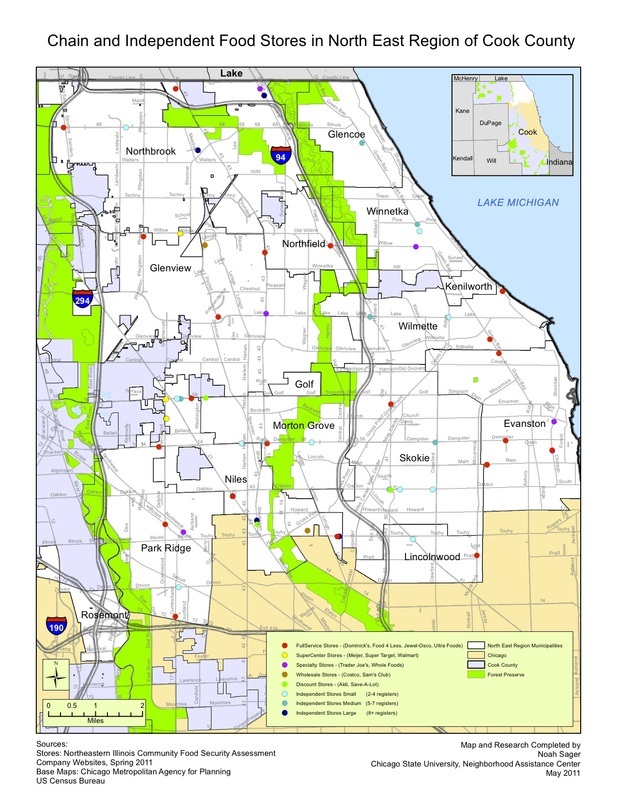 2011 Planning Map of Parks and Nature Areas in and around Chicago. 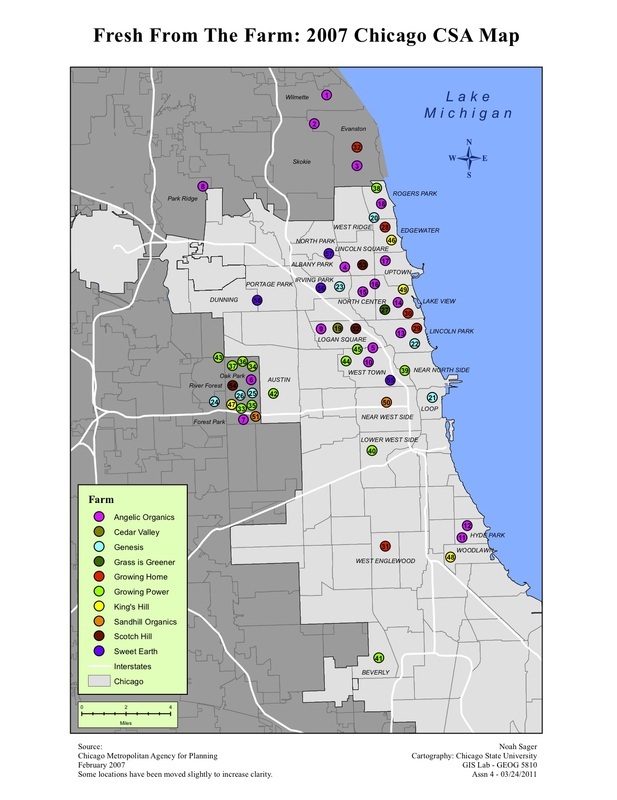 2011 Updated 2007 Map of Community Supported Agriculture (CSA) drop-off locations in and around Chicago, IL. 2011 Food Desert Map showing Food Store locations in Cook County, Illinois, outside of Chicago. 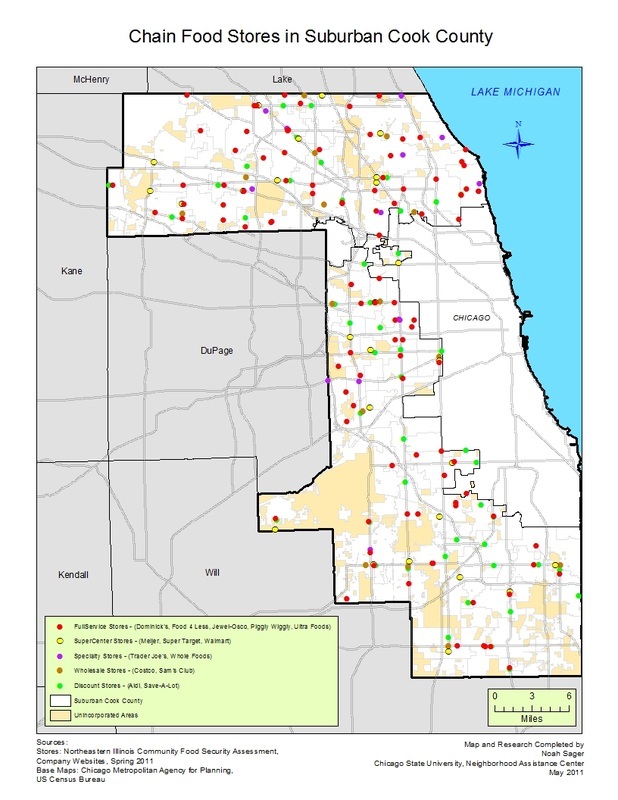 2011 Food Desert Map showing Food Store locations in the northeast region of Cook County, Illinois, outside of Chicago. 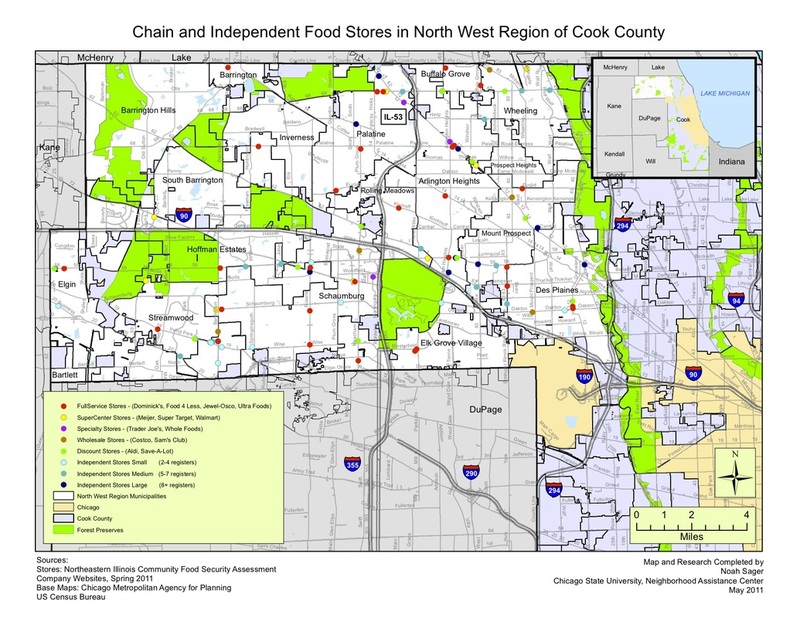 2011 Food Desert Map showing Food Store locations in the northwest region of Cook County, Illinois, outside of Chicago. 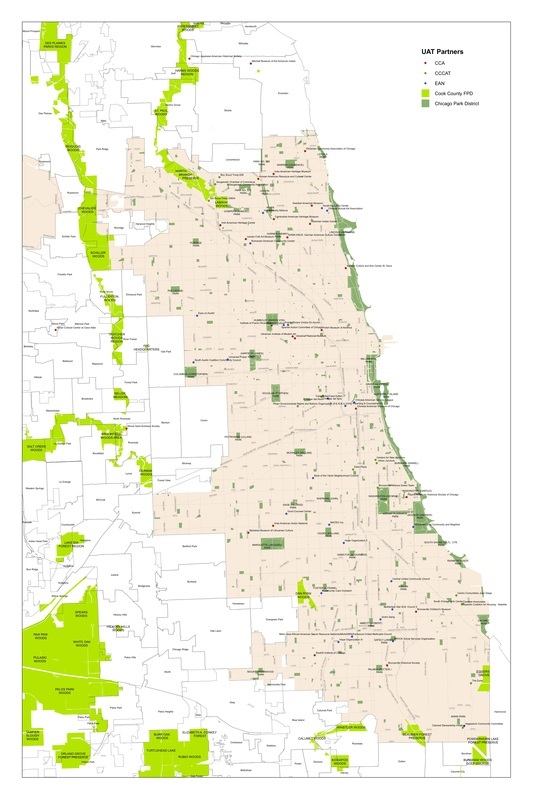 2011 Food Desert Map showing Food Store locations in the west region of Cook County, Illinois, outside of Chicago. 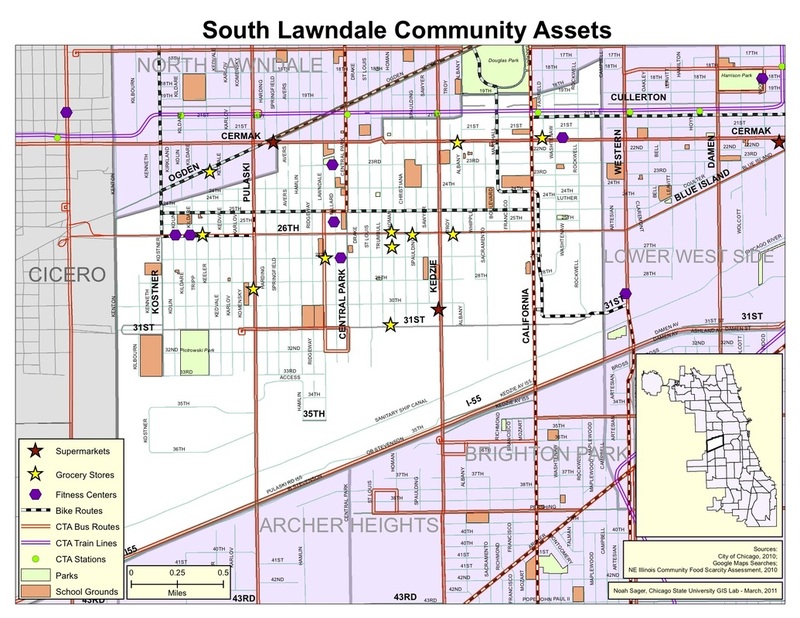 2011 Community Assets Map in South Lawndale, Chicago, created for Northwestern University for a federal Health Report. 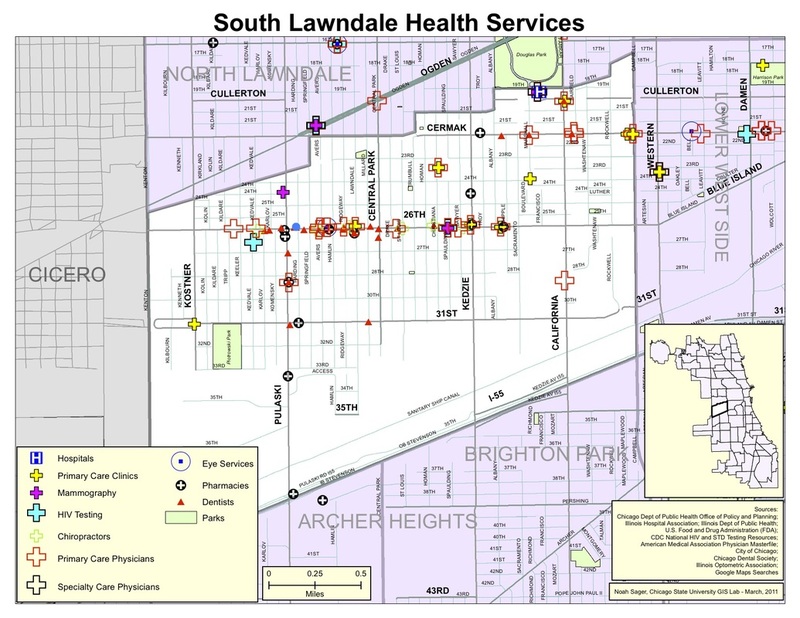 2011 Health Services Map in South Lawndale, Chicago, created for Northwestern University for a federal Health Report in Chicago. 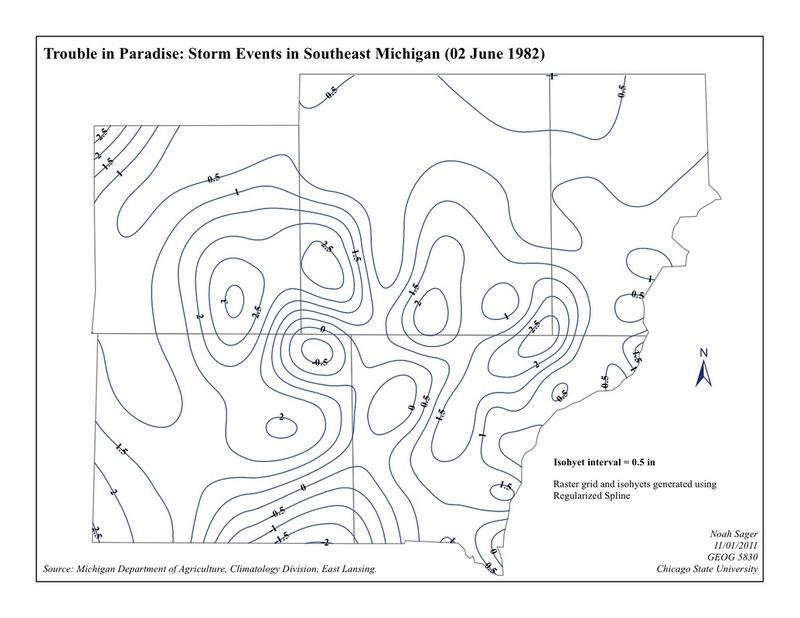 Isohyet (precipitation contour) map of Southeast Michigan using IDW Spatial Interpolation. 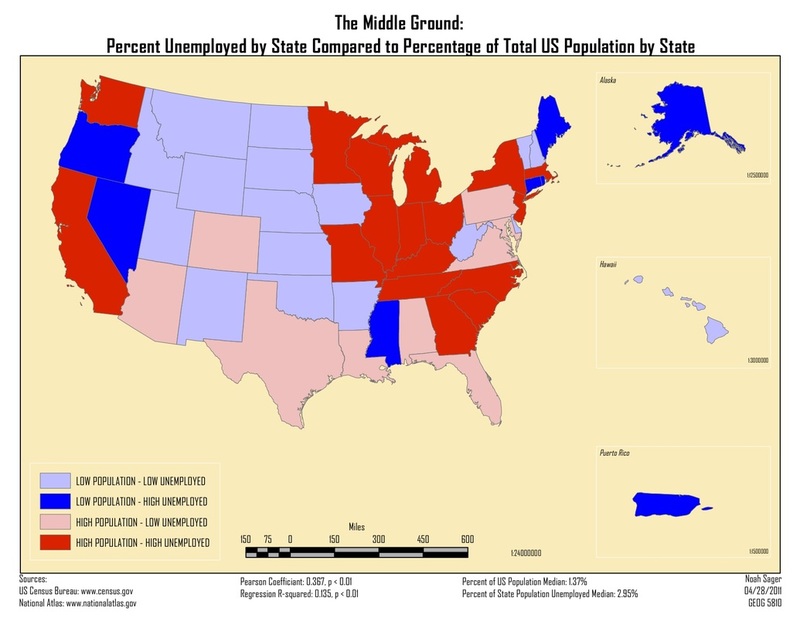 2011 Choropleth Map of unemployment and population in the United States. 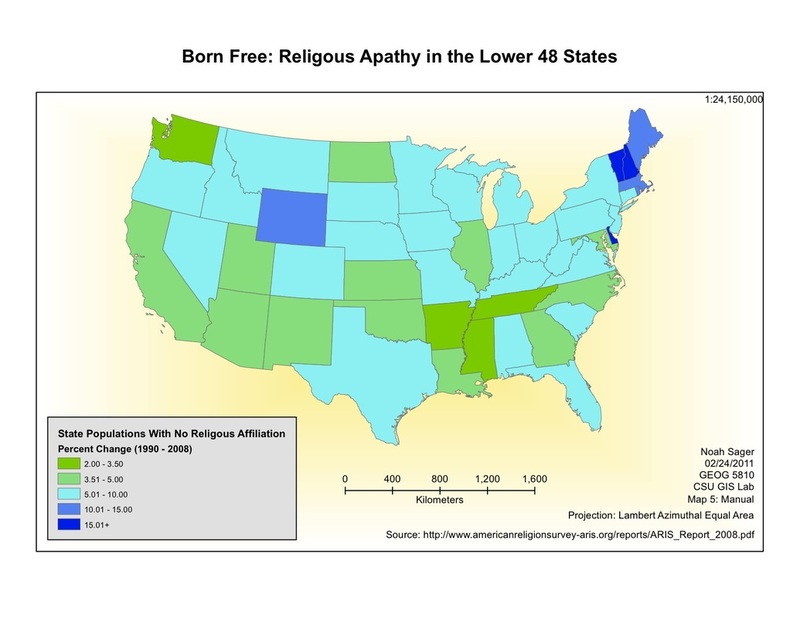 2011 Choropleth Map of the decline of religious affiliations in the United States. 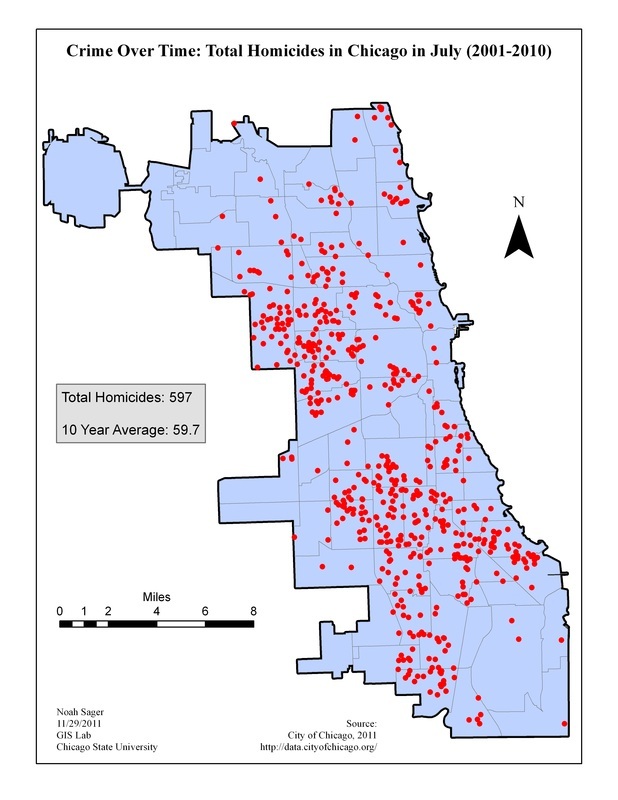 2011 Dot Map showing deaths by township in Illinois from the War in Iraq. 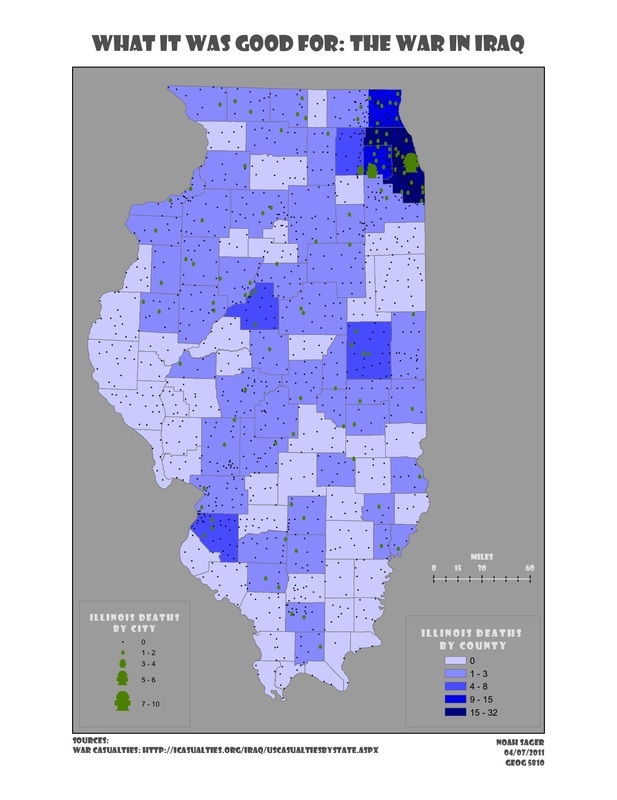 2011 Graduated Symbol and Choropleth Map showing deaths by township and county in Illinois from the War in Iraq. 2011 End of Semester Final Project for Advanced GIS. View to a Crime: A Temporal GIS Approach to Homicides in Chicago from 2001 to 2011. 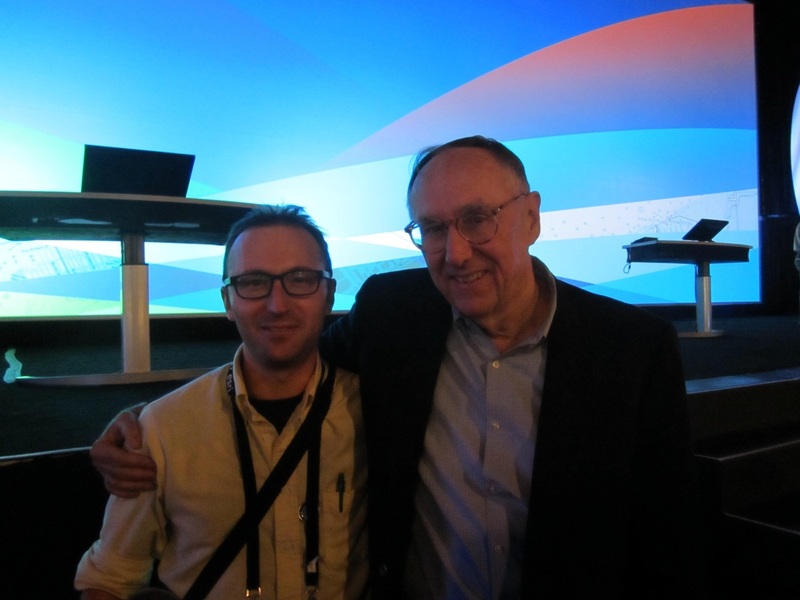 Maps were created for each month, and a time animation was created in ArcGIS. 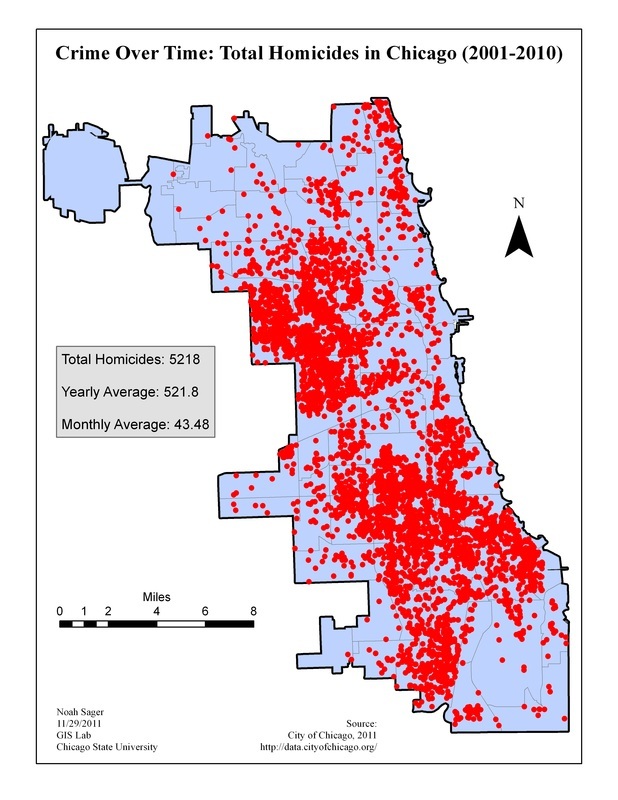 Here is one map from February, the lowest homicide month. 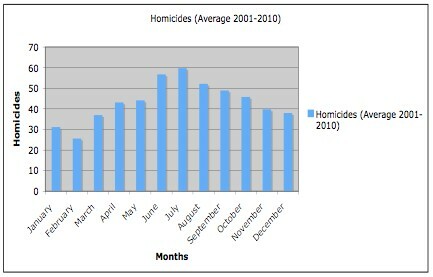 The highest homicide rate was in July. The distribution of crimes by month. Statistical analysis using a one-way ANOVA. 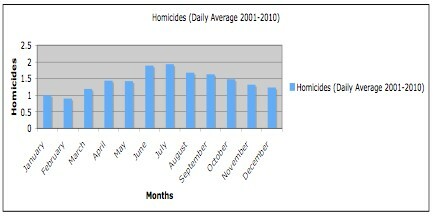 Average daily homicide rates to account for the fact that some months have fewer days than others.